Expect the unexpected on Molokai. This small island will take you back in time to a more “local” than “tourist” Hawaiian experience. You’ll find beaches and mountains as well as 2 golf courses, beautiful scenery and plenty of aloha here. You won’t find endless shopping or nightlife. A visit to Molokai is a more rural experience. Macadamia grow here. There once was a booming pineapple industry on the island. Your island adventures will include rainforest hiking, kite-flying, relaxing, peaceful beach exploration and, possibly, mule rides. Weather temperatures hover around the 75 degree mark most of the year. Driving an island rental car is pretty much the only way to take in Molokai. Tour services are limited. We offer Jeeps-- a best choice for self-guided rainforest tours. 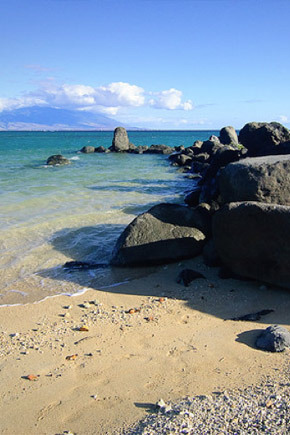 There are fewer vehicle choices here than on the other islands, so book Molokai early.